Enjoy a Private shore excursion from Monaco, Villefranche, Cannes & Nice harbor. Explore Cannes and discover its magnificent palaces along the Croisette Boulevard, including the Carlton, and the Majestic or the Martinez where famous stars stay during the Film Festival. Take the opportunity to walk the famous red carpet covering the world famous steps of the Palais des Festivals. Tour through the seaside toward the old town Antibes, built in the medieval period to protect the city from the barbarian invasions of the Goths, Visigoths, and other Saceans. Surrounded by ramparts, the town has evolved into a hub of contemporary art thanks to the famous painter Pablo Picasso, who spent a part of his life there. Discover the Cap d’ Antibes Peninsula between Antibes and Juan -les- Pins, the famous seaside resort. Enjoy one of the most visited places in France, Saint-Paul-de-Vence. This magnificent fortified village dating from the 11th century is known for frequenting some of the best painters (Chagall, Picasso, Matisse), writers (Prévert & Pagnol), and entertainers (Signoret & Montand). At the entrance of the city, right next to the old wash house of the 17th century, La Colombe d’Or boasts hosts some of the biggest names in present and past society, from Henry Matisse to Roger Moore and Tony Curtis. On the set of Le Puy, you can pay tribute to Chagall, who chose to rest here with his wife and brother. Stroll along the ramparts, cobbled streets, and art galleries punctuating the village. 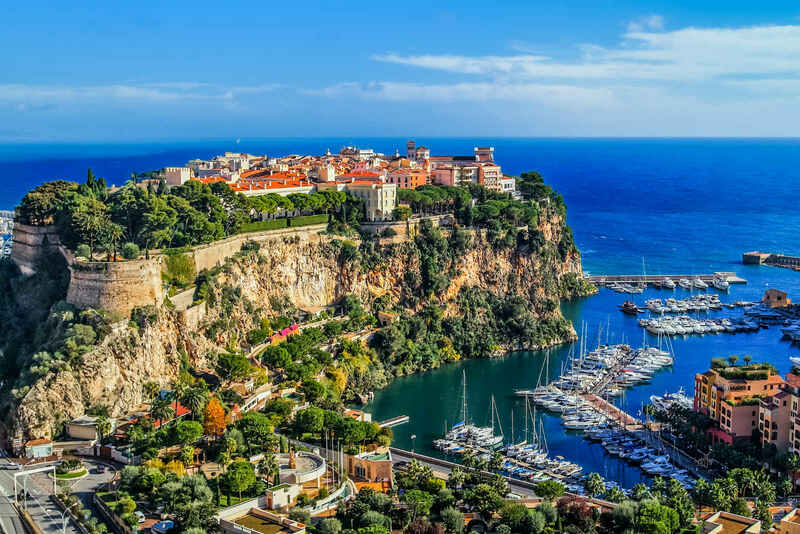 Your tour will go through on the scenic roads of the Moyenne Corniche, offering a splendid view over Villefranche-sur-mer and the peninsula of Saint Jean Cap Ferrat en route to Monaco. Discover the medieval village of Eze, one of the most picturesque sites of the French Riviera. Dating back to the Middle Ages, the village was built on top of the rocky outcrop for security reasons, and by 1706, the walls were dismantled by monarch Louis XIV. Take the cobbled streets and reach the top (427 meters high) where you can find the castle ruins and an exotic garden. Visit the famous Fragonard perfume factory down in the Village. Go through the village of La Turbie, also called the “Monaco Terrace” because of the panoramic view of the Principality of Monaco. Admire the ruins of an impressive monument (50 meters high): the Trophy of the Alps, dedicated to Emperor Augustus, was built in 7 BC on the road that linked Italy to Cimiez (the Roman Quarter Nice). You will then reach the Principality of Monaco. This old town on “Le Rocher” (the rock) overlooks the sea and harbor (60 meters high), with a clear view of the Prince’s Palace and the Changing of the Guard (11:55). In front of the Palais du Prince, you will notice the Carabinieri Barracks, which was built in December of 1817. In 1930, the Justice Palace, built in solid tufa (a porous gray stone also used to construct the walls) was inaugurated. The Oceanographic Museum was also created there over a century ago by Prince Albert of Monaco. Tour Monte-Carlo and walk through the famous Grand Prix track of Formula One. Discover the world famous Casino de Monte-Carlo, which was built in 1863 and later expanded by the famous architect Charles Garnier. Visit the beautiful luxury hotel, owned and operated by SBM, The Hôtel de Paris Monte-Carlo, which has its private wine cellar, one of the largest and oldest in the world.